Cheating Woman Swallows Her Phone to Prevent Her Boyfriend From Reading Her Text Messages! 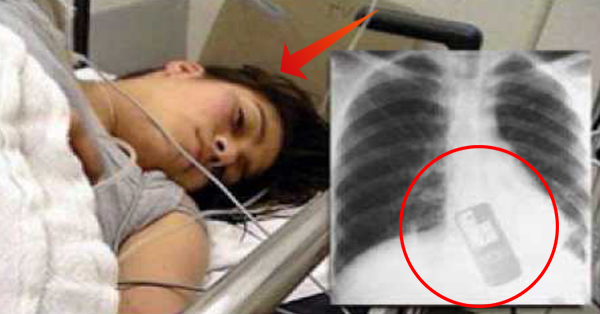 Andrea Andrade, the 19-year-old woman who was rushed into the Hospital and taken an X-ray of her chest after swallowing her phone. The image from the X-ray result shows that her phone is really inside of her. According to the report, her boyfriend Renato wanted to see her phone after suspecting her that she's cheating on him. But she refused to give it to him, instead she swallowed her phone just to prevent him from reading her text messages. She was then rushed to the Hospital when she started feeling the harsh from the incident. The girl was operated upon to save her life. No one heard about them after the unpleasant incident. What are your thoughts about this CLEVER woman? Do you think that this one is worth the risk? That sarcasm in the last sentence was definitely noticeable. Although I do think that her idiocy is beyond the knowledge of mankind, she could've just threw away the sim card right? First of all I wouldn't cheat because I love my boyfriend to death. Second of all I'm not stupid enough to swallow my own phone. And third of all whoever she was texting should know if she had a bf or not and if he did he's a big idiot, but if he didn't he should ask her and do the right thing. how come she thinks that swallowing her phone is the only way XD why didn't she think first, why is she hinding a secret messages, or why is she cheating her partner?? like duh! 'DELETE' button is ACTUALLY exist in every kind of phone in this whole wide world! -is this how humanities use their brain now a days? FAKE ARTICLE and a big fat CLICK BAITer!!! "...she started feeling the harsh from the incident." WTF??? Ever heard of grammar lessons? Pfffttt! HAVE YOU EVER HEARD OF A DICTIONARY, DUMBASS?! How lucky she don't own a note 4!